Most of you probably know our Head of Copywriting Michael Dill, who (among other things) accompanies the videos of „Steinigke on tour“ as a commentator. 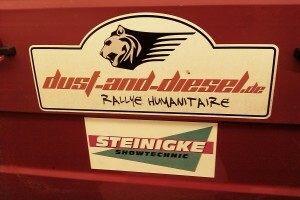 Well, Michael is now on his way to Africa to take part in the rallye „Dust and Diesel“. As long as his time and the internet connection allow it, he will keep us updated with short extracts along the way. The Eurolite LED IP Strip is a self adhesive LED strip, which offers an easy installation because of its high adhesive strength. The complete LED strip set is composed of a remote control in credit card format, a control unit, a power supply unit with 36 W and of course the strip with a length of 1.5 meters. Due to the plug-type system, there is no need for soldering, the installation is very easy. The flat, dimmable LED strips can be cut every 10 cm – this offers a huge variability of use. A series connection is made possible by the connector, which comes with the device. The power supply unit supplies up to 7 LED strips. The complete LED strip set is almost perfect for indirect lighting, especially for fair or shop applications, to create a comfortable atmosphere – warm colors, for example, can have a calming effect on the ambiance. The LED strip scores with a high intensity of brightness and colors. It is equipped with 45 RGB LEDs. All the connection pieces are of a professional quality. You can choose between an automatic color change and the manual color and program selection with the remote control. Built-in programs offer color change, color fade and strobe effects. It’s a plus that the speed of the programs and the brightness are individually adjustable. It should also be mentioned, that 16 colors can be picked directly and that there is a memory function. The LED strip can be mounted inside as well as outside (IP 68), it has a silicone sleeving, which protects the damageable LEDs against water. The control unit of the LED set is compact, it can be built in, and it has connections for the power supply unit, the remote infrared sensor and the LED strip. The functionality and the quality of this products leaves nothing to be desired. 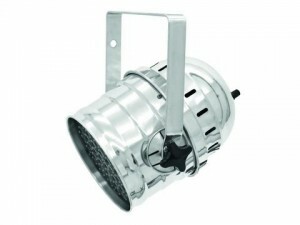 With the Eurolite IP FL-series you can set beautiful light accents around your house and garden. 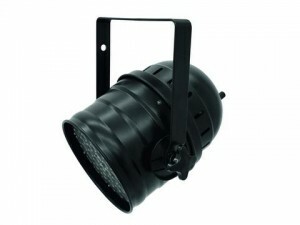 The small LED floodlights are weather-resistant and can be used for example as path lighting. The spots meet the IP 54 or IP 65 standard and so are well protected against rain. The choice of colors doesn’t leave any open desires: The floodlights are available with cold white or warm white light as well as RGB. The bigger FL-50 is perfectly suited for the illumination of signs outdoors. An overview with all EUROLITE IP FL floodlights you can find here. This PAR spot is able to do more! The Eurolite LED PAR-64 RGBW+UV looks like any other PAR spot, but there’s a lot more inside: Besides the RGBW LEDs, there are also UV LEDs hidden in this housing. So the spot can not only be used as a normal PAR spot, but also for special effects with UV light. This is a benefit especially for small stages and clubs, because they don’t need to install several devices for the use of UV-effects: the short and the long PAR can offer both possibilities in one device. Let’s start with the conclusion: The exhibition becomes better from one year to the other. One reason therefore is surely the experience, which the organizers could gain over the last three years. The arrangement of the space has been optimized and the building up has been made easier for the manufacturers. Another reason is the fact, that in people’s minds the exhibition slowly establishes itself as an industry get-together, which just didn’t exist in Germany in this way until now. Seeing the completely positive response, the exhibition will surely attract even more visitors in the future. Steinigke used the Mobile Entertain to introduce its Hybrid series in detail. Important for us: the idea of a multiple effect in this form seems to be liked by many people. The interest in it was enormous. Of course, the lottery was very popular, in which we gave away a Eurolite PUS-5. We are really happy about being a part of this exhibition. It exudes a pleasant charm between informal and friendly. The visitors stay there for several hours in this relatively small hall. This way, conversations develop, which are deeper than those at the most big events. The carefully composed program of lectures and the „discussions cafe“ are additional factors, which contribute to the friendly character of the Mobile Entertain. By the way: everyone, who wants to see the lecture about „The magic of the sync button“ by Michael Dill, should have a look at the video here.